Light and Beauty Underneath the Brooklyn-Queens Expressway? On an island of concrete between four lanes of traffic, shaded by the Brooklyn Queens Expressway above and washed by the sound of traffic all around it, three designers see an opportunity for light and beauty. 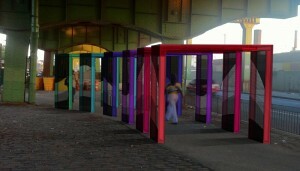 Their vision, Silent Lights, is a series of six gates that light up sequentially based on the intensity of sound and vibrations from oncoming traffic: “the transfer of aural sound into visual light.” The designers—Valeria Bianco, Michelle Brick and Shagun Singh—are the July grantees of Awesome Foundation-NYC. The Awesome Foundation-NYC grant will provide funding for LEDs and arduinos for the gates, bringing light and movement to the installation. “Once connected, the LEDs will translate the patterns of the surrounding traffic noise into an interactive wave of light and make Silent Lights a living and breathing piece of art,” wrote the designers. Awesome Foundation-NYC admired their perseverance, their originality of vision, and their efforts to bring something beautiful to the community. Silent Lights has received funding from the New York City Department of Transportation, the Design Lighting Foundation, and the Brooklyn Arts Council, and while the designers continue to raise funds, they hope to complete the project by the end of the year. They hope that the interaction between sound and light will make this necessary though neglected crossway on the edge of the Red Hook a safer and more welcoming place for all.